My boss’s son has been hitting on me at work. I devise the perfect scheme to politely turn him down, by saying I have a boyfriend. Unfortunately, my loud-mouthed cousin happens to overhear me. She says I just have to bring my new boyfriend to the family reunion this weekend. The boss’s son seems skeptical, and says he can’t wait to see photos on her social media accounts. Okay, so maybe it isn’t the perfect plan after all. Now I have to come up with someone to be my pretend boyfriend. I randomly name my neighbor, Flynn. We have nothing in common, and I don’t even know if he’s gay, but I think he’s hot. Can we manage to pull off the perfect fake relationship all weekend to save my job? And, perhaps more importantly, can we manage to keep our hands off each other while we share a room, to save our hearts? Who does my next door neighbor think he is? That he can just ask me to play the role of his boyfriend in front of his rich, uppity family? I’m a blue collar kind of guy, and I don’t even know what we’d talk about all weekend. But he’s cute, in a spoiled rotten kind of way, I’m always down for a challenge, and I need a favor of my own. When I find out we both play music, things get more interesting than I thought. Perhaps that favor I had in mind can turn a little more physical. I know he’s just using me for his own purposes, so why not use him to satisfy my own raging libido? There’s just one little problem – in the midst of pretending to be his fake boyfriend, what if I’m falling for him for real? Pretend for Me is an opposites attract, rags to riches/ blue collar to billionaire, bad boy next door, fake relationship male/male romance. It mixes humor and steam, with everything from family reunion treasure hunts in the woods to sneaking off to have private man on man action in the leaves; a friendly game of tug-of-war to bedroom games involving a very different sort of tugging. In addition to a happy ever after, it also features plenty of unique musical numbers, but no cheating and no cliffhangers. 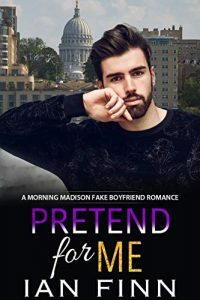 It’s a standalone full-length novel of over 65,000 words in the Morning Madison series, which can be read in any order but are best enjoyed together, and with a big glass of water nearby due to so much heat in addition to all those feels!